How long do STIG pods last is probably the most common question we get. We’re here to clear the air on this question, so we’re going to start with some simple facts and run with it. STIG pods come in a 3 pack. Each STIG pod is equivalent to 1 entire pack of cigarettes with 1.2ml of salt nicotine e-liquid that contains 6.0% nicotine by volume. 1 pack of cigarettes contains 20 cigarettes. If you are trying to quit cigarettes and have a pack a day habit, then 1 STIG will last you 1 day. To that end, if you smoke half a pack a day, 1 STIG pod will last you about 1 ½ to 2 full days. If you typically smoke a ¼ of a pack a day, 1 STIG will last you 3 or possibly 4 days. Where To Buy STIG Pods Near Me? 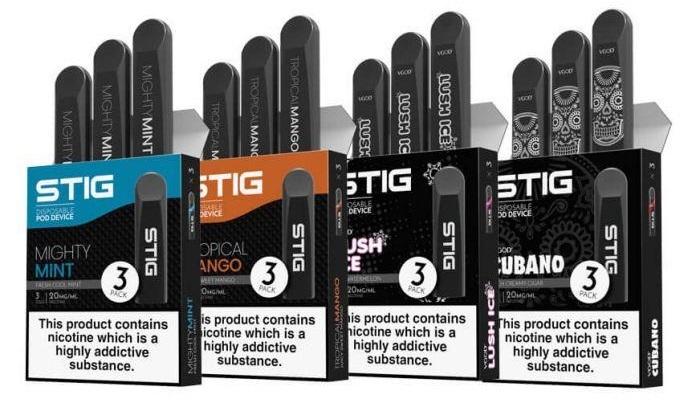 If you’ve been wondering where you can find packs of STIG pods near you, then you have come to the right place! We at STIG appreciate your enthusiasm for our product, as we take much pride in being able to provide you with the best tasting alternative to smoking. STIG can be found in many convenient stores, smoke shops and vape shops throughout North and South America, as well as the Middle East. Very soon, we hope that you will be able to find STIG packs throughout Europe. TOSS YOUR CIG. VAPE A STIG. Subscribe to our newsletter to receive updates on everything about STIG.